Often people ask me how much time I spend on each piece. Even if I kept track of these things, I wouldn’t be able to say. For one thing, I work on as many as twelve pieces at a time. Also, pieces such as this one are often made incorporating unfinished work that has finally told me what it needs to be. 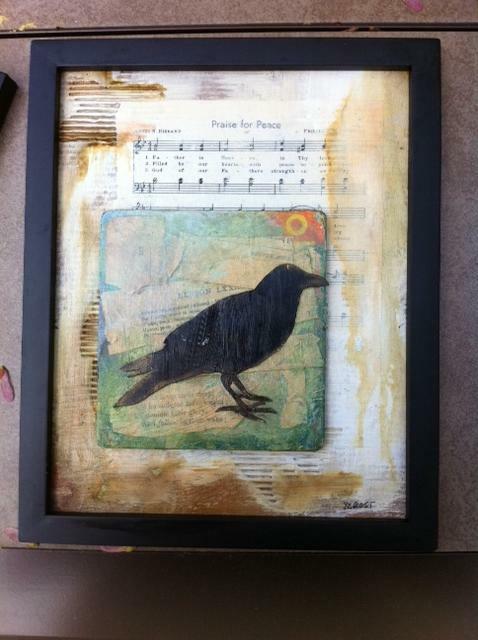 The bird on the bingo card in this piece was cut out and painted a couple of years ago. And then there’s the question of drying time. When you cook, do you count the time that the casserole is in the oven as cooking time? I do. The same goes for drying time. I don’t know how many layers of gel medium are on this piece, but I know there are many. Each one requires drying time. So, next time you ask an artist how long it took to make a piece, remember: you’re lucky we don’t work by the hour. This entry was posted in Art, collage, creativity, painting and tagged art, Arts, collage, creativity, mixed media, paint, painting, paper, postaday2011, studio, Studio droppings, Visual Arts. Bookmark the permalink.